BACK BY POPULAR DEMAND! 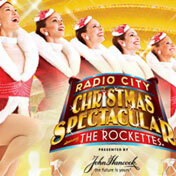 The Radio City Christmas Spectacular starring the Radio City Rockettes® is returning to Boston with an ALL NEW SHOW this Holiday Season! Experience the Spectacular like never before! Along with your traditional favorites, every performance is filled with new scenes, new sets and new songs. 1 hour and 45 minutes including intermission. Sunday: Closed unless there is a performance. When there is a performance: 2 hours prior to curtain.